Saariselkä is located in Inari municipality in Finnish Lapland, about 1100 km (680 miles) from Helsinki, the capital of Finland. 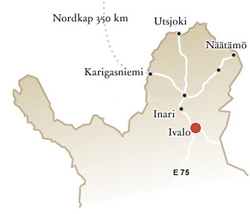 The nearest airport to Saariselkä is in Ivalo, 25 km (15 miles) from Saariselkä. The quickest way to travel to Saariselkä is to take the daily Finnair flight from Helsinki to Ivalo. The flight time is about 1.5 hours. A number of airlines, including Finnair and Blue1, have daily flights between Helsinki and most European capitals. Shuttle bus from Ivalo airport to Saariselkä/ Riekonlinna Hotel is available after each flight. Shuttle bus collects passangers also from the hotels before the flights, ask for the time schedule in your hotel. If you have more time you can take the day or night train to Rovaniemi and continue from there by bus. There are daily trains to Rovaniemi from Helsinki, Tampere and Turku (train change in Tampere). For the night trains you can book a berth in a sleeping car. Distance from Rovaniemi to Saariselkä is 260 km (160 miles), and the bus journey takes about 3–4 hours. There are also express busses from Helsinki to Saariselkä.